James McLevy is Edinburgh’s first detective, Criminal Officer number 1 and is said to be part of the inspiration for Sherlock Holmes. He worked in Edinburgh from 1830 to 1860 and solved over 2200 cases. His methods produced results with his deduction and use of psychology. He was famous in Edinburgh and called to parliament to give advice, such was his success. In 1815 he came to Edinburgh to be employed by a builder Mr Wallace, then his son-in-law Mr Walker and latterly Mr Robert Paterson. At some point he married Rosa O’Neill although no mention is made of her in all his books and she probably died early in his life. In August 1830 at the age of 34 he successfully entered the Edinburgh police as a night-watchman. Three officers joined that year; Edinburgh police officer 92, James McLevy, and in May 1830 officer 79, Andrew Goodall and officer 80, a William Mulholland who was to share many adventures with McLevy. In 1833 he became Edinburgh’s first criminal officer detective – CO 1 – and during his career is said to have dealt with 2200 cases. In 1850 the police log book described him as 5 foot 9 inches tall, full of face, grey eyes, grey hair and a fresh complexion. His stature and fame was such that he was the first police officer to get a financial award for the recovery of stolen goods, gold watches, and was invited to speak before the house of parliament in 9 June 1856 to the select committee on transportation of criminals. He published two popular books after retiral and it is said these influenced Sir Arthur Conan Doyle when writing Sherlock Holmes. There are similarities in the detective’s approach although McLevy’s is based on real cases. His sister Mary McLevy came to Edinburgh as did a Mary Rodgers, described as his niece. James McLevy died on 6 December 1873 at 5 South Richmond Street now demolished. He is buried in the prestigious Canongate Cemetery on Edinburgh’s Royal Mile alongside Adam Smith, Robert Ferguson and William Fettes. Unfortunately the marker was probably wooden and has long since disappeared although the location of the grave has been recorded. Mary Rodgers registered both deaths; the sister in 1870 and McLevy himself in 1875 before dying herself in 1895. With no surviving family nor registered will it is unknown what became of the book proceeds. This is very interesting, Mclevy is a favourite of mine. I am a great fan of Rebus but the McLevy stories on Radio 4 keep me totally engrossed by the workings of the plot lines and the variation in the mind set of the man. Brian Cox and Siobhan Redmond are superb; when will there be a TV series? Its a no-brainer. Please, no TV series, they already wrecked rebus on TV. Lets listen or read about James Mclevy and use our own imaginations. It would be great to be able to download Series 8 and 9. When are they likely to be accessible as the preceding series are all available! Ashton’s prose is simply a joy to the ear, is it based on the writing style in the original books? The cost and profitable opportunity of producing a TV series these days means that it has to appeal to a wider audience which unfortunately also means being rendered palatable to the USA – McLevy would soon have a gunslinger sidekick and a vocabulary of 1,000 words or less – in the opinion of this “Littleton brown duck” no thanks,. the Sopranos and the Wire are excellent TV series and I have to use subtitles to understand the patois so it can be done. Just listening once again on BBC 4extra to the first series. It’s just reminded me of how well written it is and with the performance of Cox and Redmond are wonderful. Radio drama at its best. I agree with all that has written by a lot of the listeners just let this wonderful Radio Drama remain with great writing, acting and just great radio presentation.. So please no TV series!! No TV please this series is a great afternoon radio treat – just me and the characters! Excellent series, but McLevy was an Ulsterman, not a Scot? I had no idea! I thought the Radio 4 drama was pure invention until I came across references in “Edinburgh” by George Scott – Moncrieff recently. I wish there was some acknowledgement and introduction re the historical actuality in the Radio 4 broadcasts, especially given the imputed influence of JM’s published books upon Arthur Conan Doyle’s character of Sherlock Holmes. MacLevy’s career seems worthy of a documentary in it’s own right ….. So sad that it has ended. I have enjoyed both the radio series and the books. I could see a follow on series but I doubt very much it could happen…………………. Really well done Mr. Ashton and thank you for many hours of entertainment…………. I too hope that “The Last Goodbye” is not the last we hear of McLevy on Radio 4. It has been without a doubt one of the consistently best things on R4 I have ever enjoyed. I have always looked forward to new installments of the McLevy saga and I am so disappointed that it has come to an end. warmest congratulations to the (perfect) cast and especially David Ashton, his understanding of character and use of language has been a supreme pleasure. The final episode made me laugh out loud at times and the end of Roach was very touching. Thanks to all, you will be missed. Wanted to congratulate the BBC on a wonderful Radio series.. David Ashton’s writing was sublime loved it.. I have now bought the series through Audible books so I can listen to again as & when I wish.. I want to thank all of the cast for giving us such an enjoyable radio series and all who worked on it they should all be very proud again thank you !!! 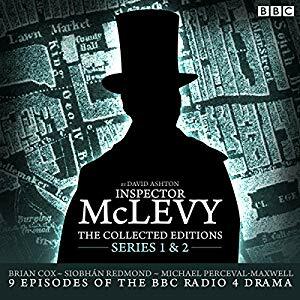 The number of positive reviews on the Amazon website for Mr. Ashton’s ‘McLevy’ is testimony to the success of these splendid radio shows. The dialogue, and Insp. McLevy’s soliloquies, are quite remarkable, and I never get tired of them. A rare gem, with engrossing plots and superb acting. The novels are almost as good, too. Hats off to all concerned.